Many people opt to do literal translation, word for word even in official documents whether it be in school or at the workplace. That is a big NO. Literal translation can potentially take away the meaning of a sentence. The correct way to translate anything is to read the full sentence and identify the contextual meaning. Now that brings us to something else: Contextual meaning. What is context? 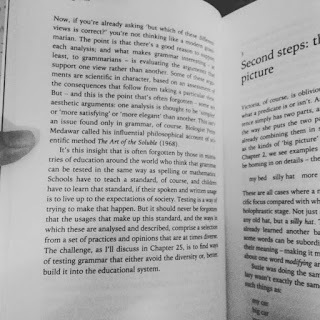 What is contextual meaning? What is the significance of it? 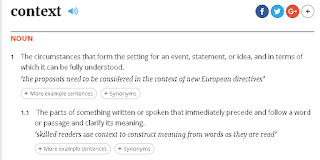 while according to the Cambridge dictionary, contextual is "related to the context of something" and "It's impossible to understand the nuances of an isolated word without some contextual clues." A word has multiple meanings but when applied, used in certain pieces of text, it usually denotes only one meaning. Therefore the context should be considered to determine the meaning of the word. Most of the time, context is developed intuitively by the language user. In a piece of text, a word has four layers of context (Dash, N.S., 2008). However, for the sake of simplicity, I'll forgo the names of the layers (you may take a look at the embedded link if you'd like to know more). Now, the four layers are what determines the meaning of the word. So I'd give my personal opinion that most of us try to take the easy way out by doing literal translations. I made that mistake when I was a child who would slug her dictionary everywhere together with her novel. However, as I developed native fluency in the language through time, I found that sentences give meaning, not just individual words. "Isolated words don't usually makes sense...a sentence expresses a complete thought" (Crystal, D., 2017, p. 3). That, I agree, Professor Crystal. or refer to the references if you prefer. 2. Crystal, David (2017). Making Sense: The Glamorous Story of English Grammar. London: Profile Books. Experienced Teach for Malaysia 2015 Fellow with a demonstrated history of working in the non-profit organization management industry. Taught for a total of 5 years, mainly English with more than 2 years in government secondary school. Skilled in Microsoft Office, basic graphic design, editing, public speaking, creative writing, literacy in English and possesses strong professional research ability. Graduated with a Bachelor of Science focused in Communications and Psychology from Upper Iowa University and Post-Graduate Diploma in Education (English) from Universiti Utara Malaysia. Classes are done only on weekends from 10am to 1pm, based on request.